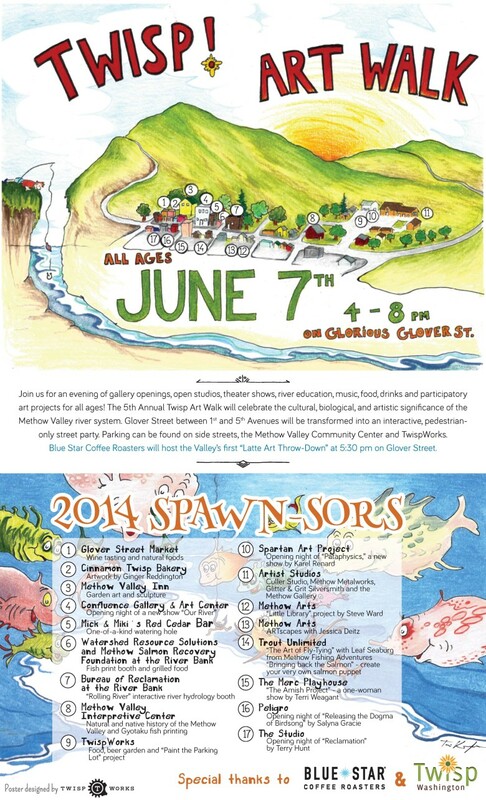 The 5th Annual Twisp Art Walk will celebrate the cultural, biological, and artistic significance of the Methow Valley river system. A thriving artist community, the Town of Twisp, WA, will host an evening of gallery openings, studio tours, theater shows, river education, music, food, drinks and participatory art projects for all ages! Glover Street will be transformed into an interactive, pedestrian-only street party featuring Austrian artist and geomancer, Karin Wimmeder, creating a large-scale, participatory, street-painting project; the forming of a “Human River” that will run through the main street of Twisp; and the openings of four new shows at local galleries, as well as the premiere of a new theatrical performance at the Merc Playhouse. 14. Parking can be found on side streets, the Methow Valley Community Center and TwispWorks. The art walk is a free event that runs from 4 to 8 pm. Other participants include the Methow Valley Interpretive Center, the Merc Playhouse, the Methow Valley Inn, Spartan Art Project, Blue Star Coffee Roasters, open artist studios at TwispWorks and more! Contact: Confluence Gallery, 509.997.2787 or info@confluencegallery.com or TwispWorks, 509.997.3300 or info@twispworks.org.